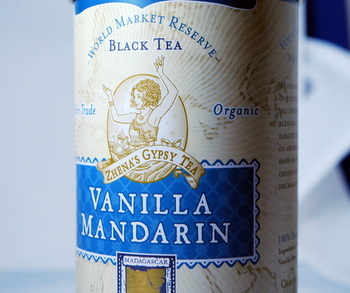 Zhena’s Gypsy Vanilla Mandarin Tea is one of the non holiday options (as opposed to the seasonal Caramel Apple Tea) from the organic fair trade company. This tea has a black tea base, to which notes of vanilla and mandarin orange have been added. Unlike the Lipton Mandarin Tea, the orange notes are very subtle in this blend. Partially, this contrast stems from the fact that the Lipton tea has a green tea base with a much lighter flavor to it, but mostly it is because Lipton really focuses on the fruit flavor and Zhena really focuses on the tea. The flavor of black tea is both the first thing you smell and taste when you brew a cup, followed by very smooth, but subtle, vanilla flavor. It really comes through the tea beautifully without being artificial or overwhelming. The orange is also subtle and only appears as of a hint of citrus in the aftertaste of the tea. It adds just enough to brighten the cup, but is definitely playing second fiddle to the vanilla and black tea.